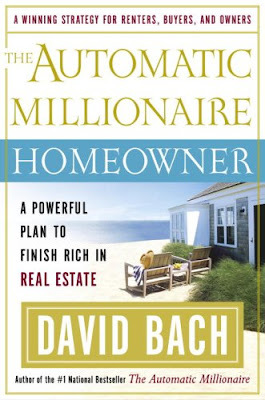 The book of the week was The Automatic Millionaire Homeowner by David Bach. I read one of Bach's books previously and I really liked it, so I thought I would see what this one is about too. I agree with Bach's philosophies on investing more than any other author I have read. He believes in eliminating bad debt and utilizing good debt in smart ways. He writes about owning your own home while working on purchasing a second or third property to generate cash flow. Two things I would like to discuss from this book are making your mortgage automatic and way to get a second property. Both of these ideas got me really interested! This is really smart. First off, I am huge on automating every aspect of my finances. I have my paycheck automatically deposited into my checking account once a month on the 28th. I have my rent automatically withdrawn from my checking account on the 1st. I have my church donation paid automatically on the 1st of each month from my credit card, and I make all my purchases with my credit card so I can get cashback with all my purchases, and finally my credit card is automatically paid on the 2nd of each month. On the 3rd of each month I have my ING savings accounts and my Vanguard Index funds withdraw X amounts from my checking account. It takes my less than 30 minutes a month to review my expenses and verify everything is being charged correctly. And I do this by checking my accounts on Mint.com a couple times a week on my phone and this also helps to assure that I am staying within my budget. Automating my finances is one of the best decisions I have ever made. Bach suggests a simple, but not commonly practiced method of getting your second property. If you have lived in your house for a few years, instead of selling your house and buying a new property all together, keep your old property and dip into your equity you have accumulated over the years you have lived in your current property and use that as your down payment on your new house. Then rent out your old home that you still have ownership over and create some cash flow for yourself. DISCLAIMER: This book was written in 2005, at the peak of the real estate boom. In 2010, it is not a certainty that your home has grown in value. However, I only invest for the longterm and in the longterm home prices will always increase. The greatest stock pickers in the world assess what products and services consumers will be buying into, what consumers "need"... well everyone needs a place to live. I contend that real estate is the best longterm investment in the world. I really like Bach, and I purchased another book by him this week, so you should be expecting to hear most about him soon. As always, if you have any questions on the book don't hesitate to ask. I would be more than happy to help anyone that wants it. He Will Teach You To Be Rich!! !